The Series Wi-Fi wireless micro controller with a lot of GPIO pins , Great for Learning and Protyping ESP8266. ✔NodeMCU is the fast leading edge low cost technology to WiFi, which based on the mature ESP8266 technology to take advantage the abundant resources available on the web. 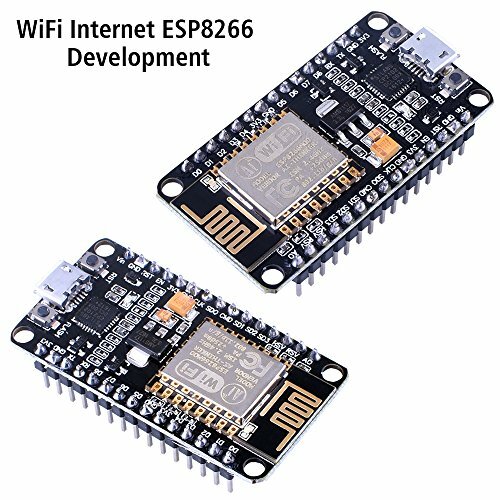 ✔ESP8266 is a highly integrated chip designed for the needs of a new connected world. It offers a complete and self-contained Wi-Fi networking solution, allowing it to either host the application or to offload all Wi-Fi networking functions from another application processor. ✔ ESP8266 has powerful on-board processing and storage capabilities that allow it to be integrated with the sensors and other application specific devices through its GPIOs with minimal development up-front and minimal loading during runtime. Its high degree of on-chip integration allows for minimal external circuitry, and the entire solution, including front-end module, is designed to occupy minimal PCB area. ESP8266 is a highly integrated chip designed for the needs of a new connected world. Its high degree of on-chip integration allows for minimal external circuitry, and its designed to occupy minimal PCB area. NodeMCU is an open source IOT platform. It uses the Lua scripting language. It is based on the eLua project, and built on the ESP8266 SDK 0.9.5. It uses many open source projects, such as lua-cjson,and spiffs. It includes firmware which runs on the ESP8266 Wi-Fi SoC, and hardwarewhich is based on the ESP-12 module. It uses CP2102 as UART bridge, and can flash firmware automatically by using nodemcu-flasher. It support apple's MAC OS. It is an integrated unit with all available resources on board. It is super simple to complement your existing Arduino projects or any development board that has I/O pins available.